These 8 Healthy Tuna Salad Recipes would be perfect for an easy lunch or a light dinner. We know that you're going to love these deli salad recipes because they're insanely nutritious and incredibly delicious. It's your choice if you'd like to serve these tuna salads by themselves, on bread, or in a salad. Luckily there's no wrong way to enjoy these healthy recipes. It doesn't matter how old you are because everyone will love these tuna recipes. So, you should grab the ingredients and make these easy healthy recipes as soon as possible. You definitely won't regret it. 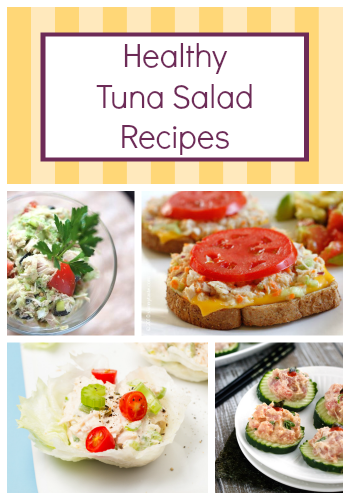 After you finish making these tuna salad recipes, come back to let us know which recipe was your favorite. Want even more deli salad recipes? Check out these 9 Eggcellent Egg Salad Recipes. No-Mayo Avocado Tuna Salad - The avocados make this tuna salad extra creamy. No-Mayo Tuna Salad Recipe - You can serve this tuna salad in martini glasses to create a fancy appetizer. Healthy No-Mayo Tuna Salad - This deli salad recipe would be perfect anytime and anywhere. Spicy Tuna Bites - Are you feeling adventurous? If so, then you need to try these Spicy Tuna Bites. They're unlike any other tuna salad recipe. Are you looking for healthy potluck recipes? Then you need to check out our 8 Potluck Recipes eCookbook. Tuna Pasta Salad Recipe - This recipe combines the best tuna salad recipe with an amazing pasta salad recipe. Skinny Tuna Melt - Make your tuna salad a bit more interesting by transforming it into an open-faced sandwich. Crunchy Tuna Salad - There are so many good things about this Crunchy Tuna Salad. Cranberry Tuna Salad - Why be boring? Sweeten up your traditional tuna salad recipe with cranberries and apple slices.